Hyourinmaru is the manifested spirit of Toshiro Hitsugaya's Zanpakuto that is seen during the Zanpakuto Unknown Tales arc. 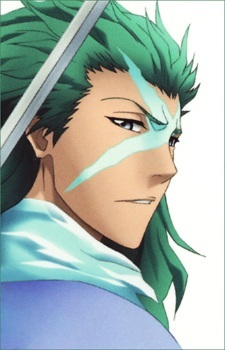 Hyourinmaru's appears as a tall, young man with long, wild, teal green hair, an icy blue X across the center of his face, and ice clear eyes. In his human form, Hyourinmaru appears as a stoic and silent man dressed in loose samurai-like garments a chain around his waist (similar to his Zanpakuto form) and a dull gold adornment on his chest (similar to the design on Hitsugaya's sash). His arms and legs are covered in ice, similar to Toshiro when using Bankai and has a prehensile tail with an icy tip. At any time, Hyōrinmaru can take the form of a gigantic, icy blue, serpentine dragon with large wings and an echoing voice.